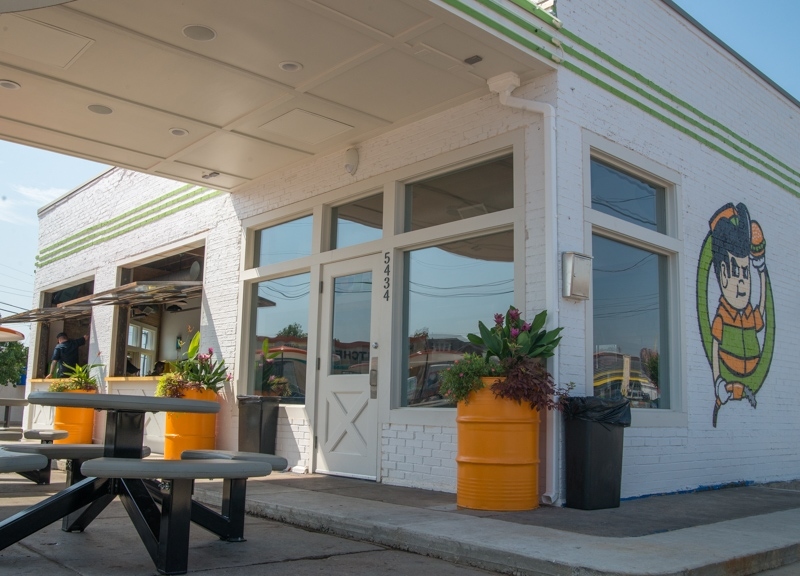 The Two-Weeks-Old Pints & Quarts Already Feels Like An Established Lower Greenville Veteran. 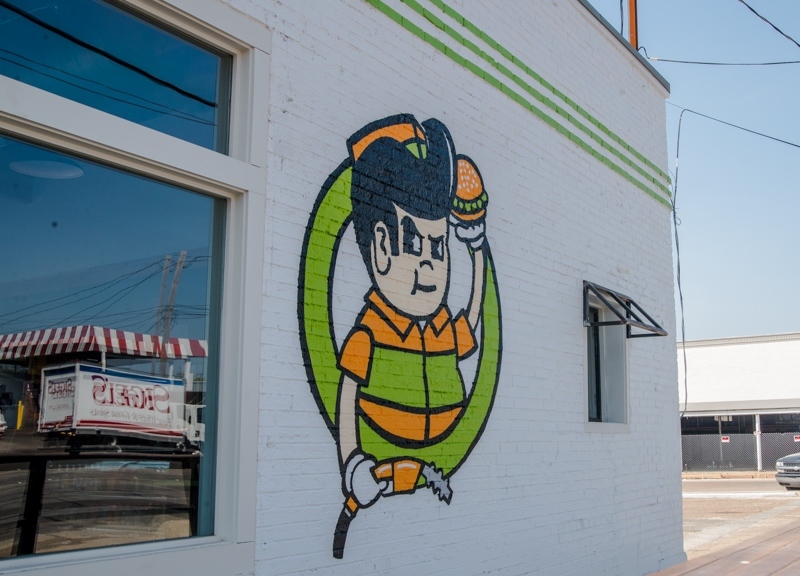 Brooke Humphries knows that Dallas isn’t exactly lacking for killer burger options these days. 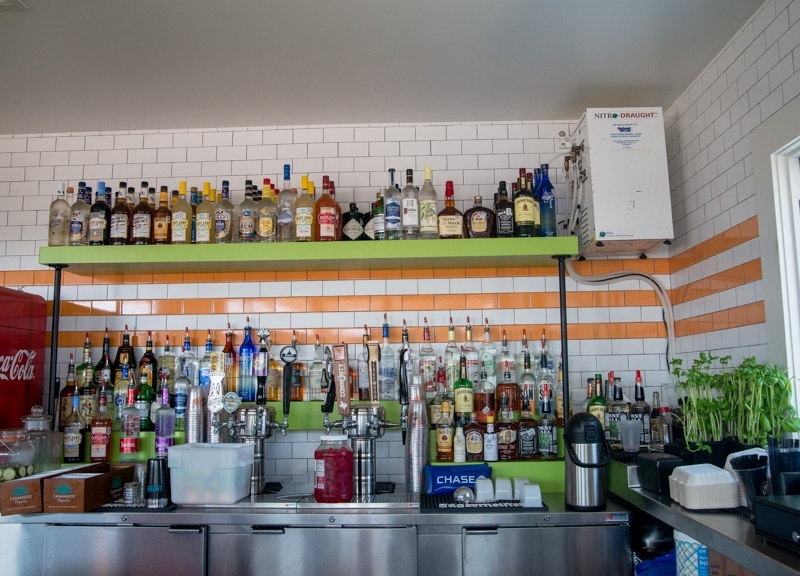 But the force behind such revered area establishments as Beauty Bar, Barcadia, It’ll Do Club and Mudsmith has never really been one to shy away from a little competition, either. And now, with her newest venture, she’s jumping into Dallas’ beefiest fight. Indeed. 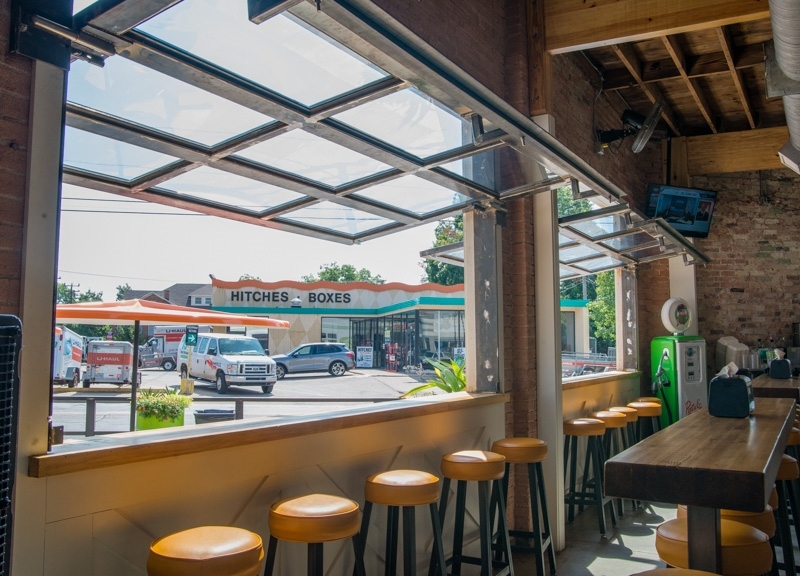 In fact, the early returns on Humphries’ charming new spot at the intersection of Ross and Greenville are already finding her near the top of the burger leaderboard. 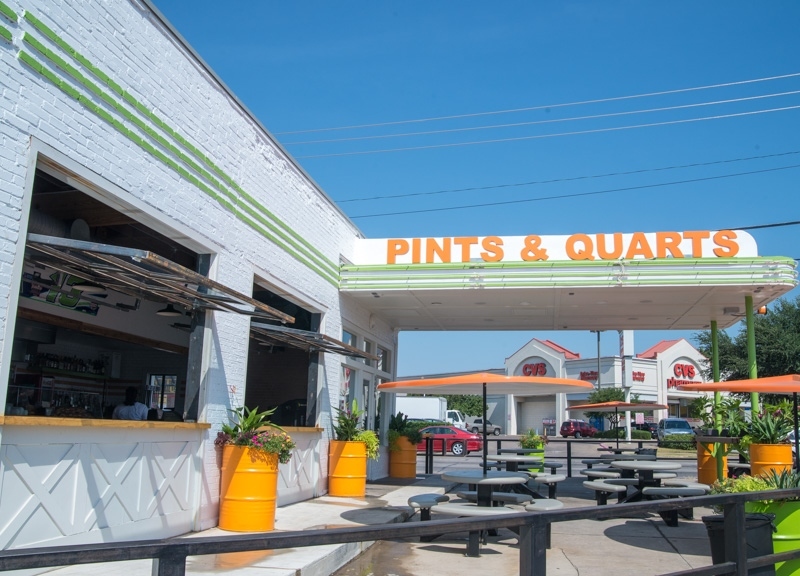 Since opening the doors of Pints & Quarts just a little more than two weeks back, her newest place has quickly established itself as one of Lower Greenville’s hottest dining destinations — so much so, Humphries reveals, Pints & Quarts’ first two weeks of actual sales have actually exceeded her initial estimates by 50 percent. The fact that the place is tough to miss can’t be hurting those figures. 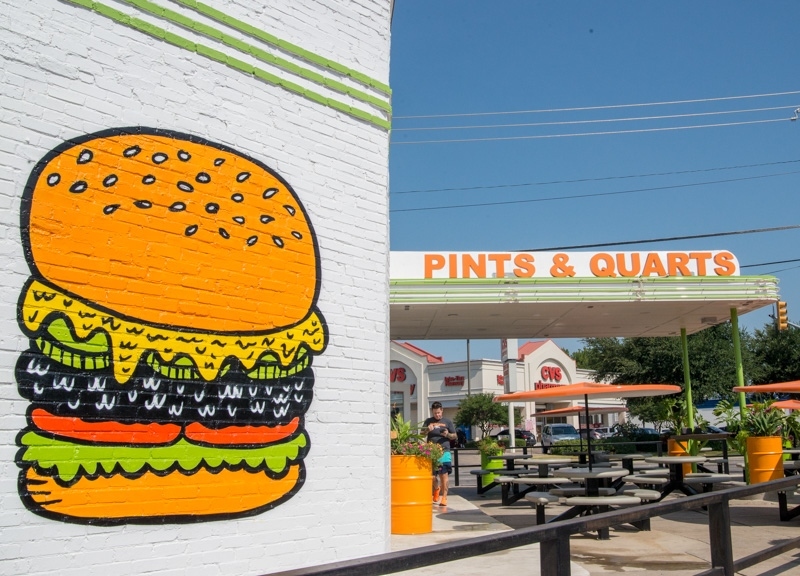 Right at the corner of one of Lower Greenville’s busiest intersections, Pints & Quarts boasts a clean, unmistakable white paint job that’s been contrasted by bright orange and green pinstripes courtesy of the Sour Grapes crew. 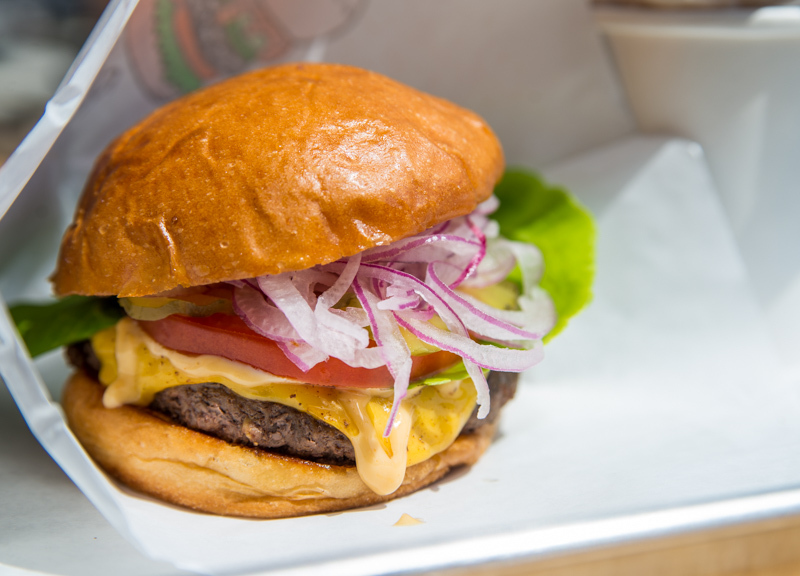 Also striking are its eye-grabbing neon lights and its Nick Quintero-designed burger-themed murals. 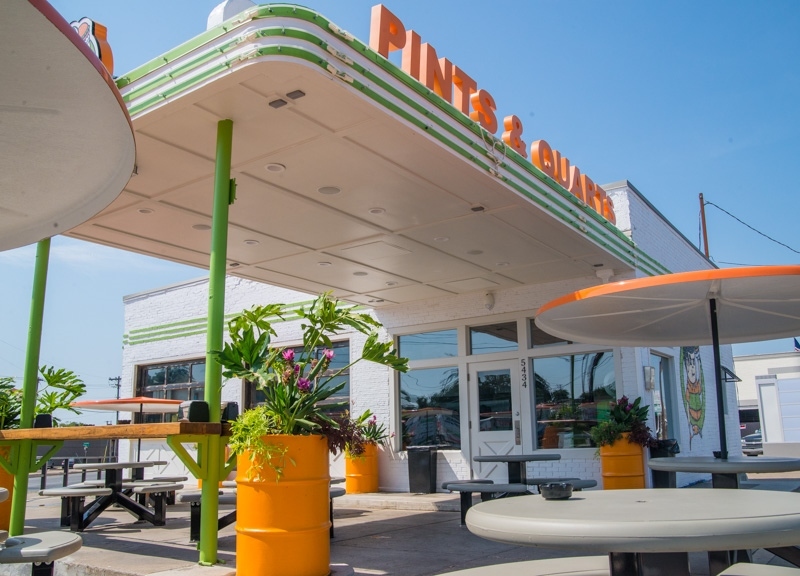 It’s all starkly retro in its overall branding, featuring several nods to the space’s past life as a gas station through custom-designed gas pumps and a racing car door that adorns the modest interior. 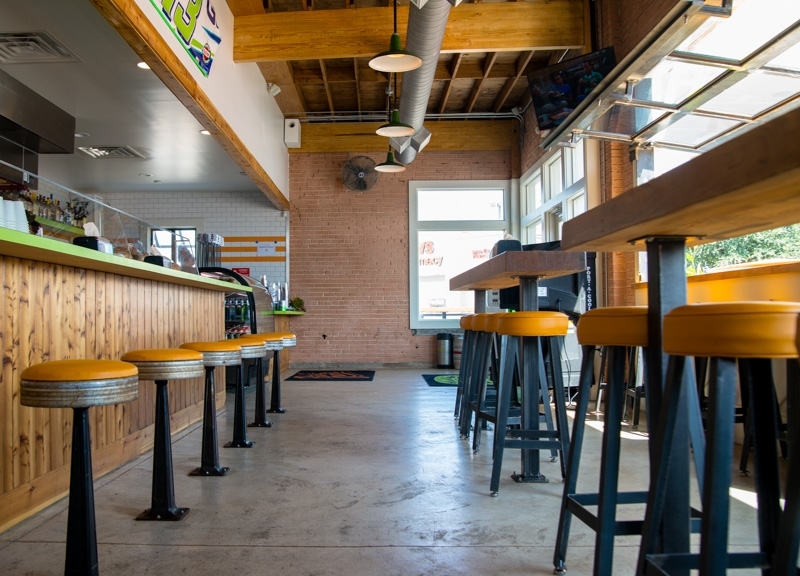 Outside, several tables serve as the main dining area beyond the barstools located inside. With large windows to open to provide an indoor-outdoor appeal, the whole joint is warm and inviting — and intentionally designed to seem much larger than it actually is. 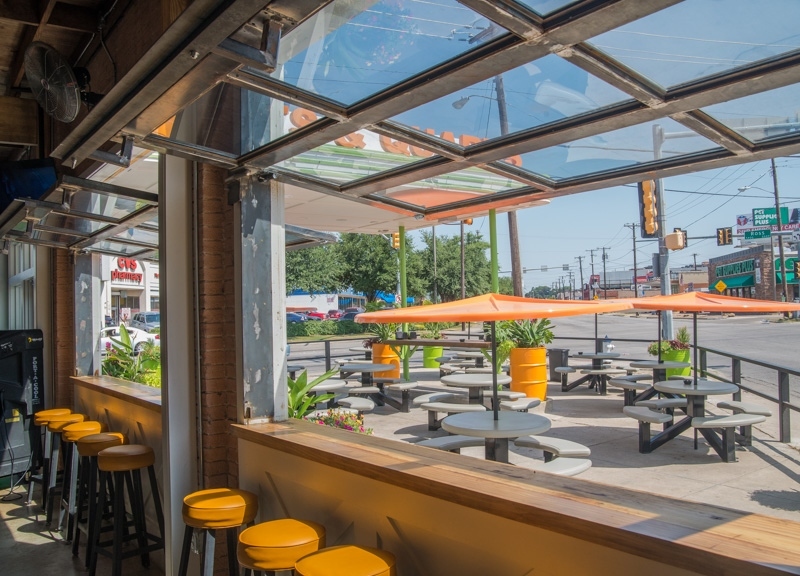 That same ethos applies to the inside space’s open kitchen and bar combination, which Humphries says is the only one of its kind in Dallas. 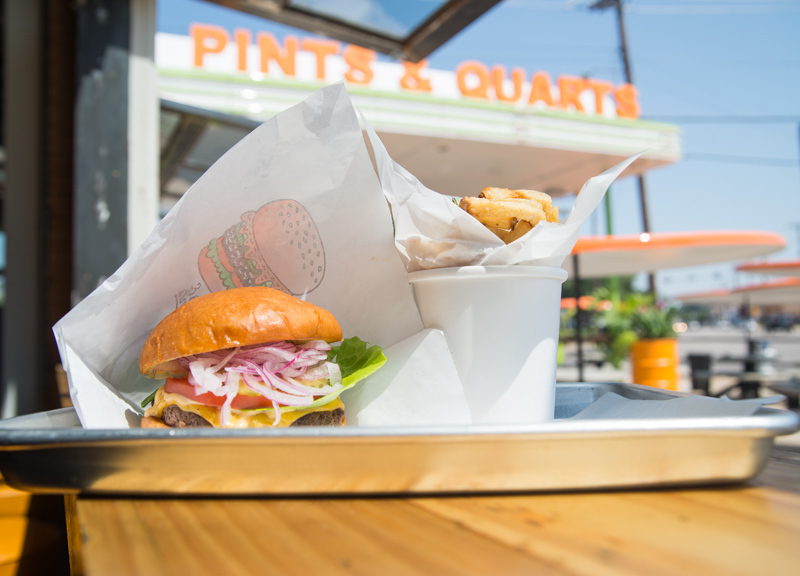 Just as distinct at Pints & Quarts — or Ps & Qs, for short — is the food itself. 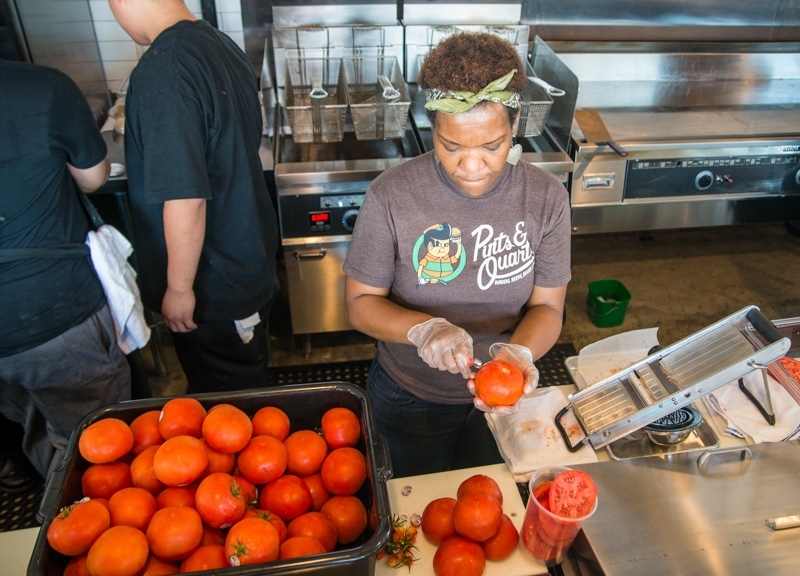 All of the vegetables used are cut fresh each morning and, notably, the onions are cut especially razor-thin for use in both the burgers and the onion rings. The potatoes used for fries are cut each morning, too. 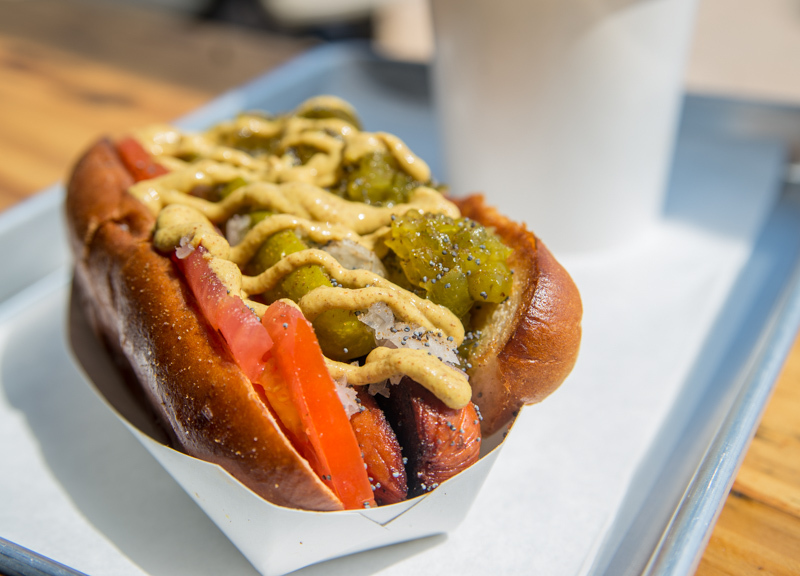 Even the sauces here — save for the standard ketchup, mayo and mustard options — are made in-house daily from scratch. The freshly baked potato buns used for the burgers, meanwhile, are delivered daily from a local bakery, and make for the perfect compliment to the specially designed ground beef used for Pints & Quarts’ deliciously messy burgers. 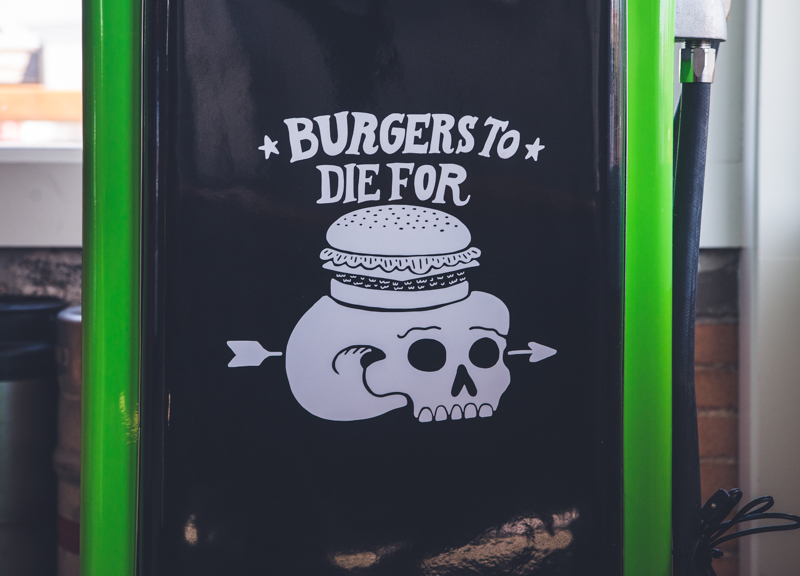 Burgers aren’t the only impressive fare offered, either. 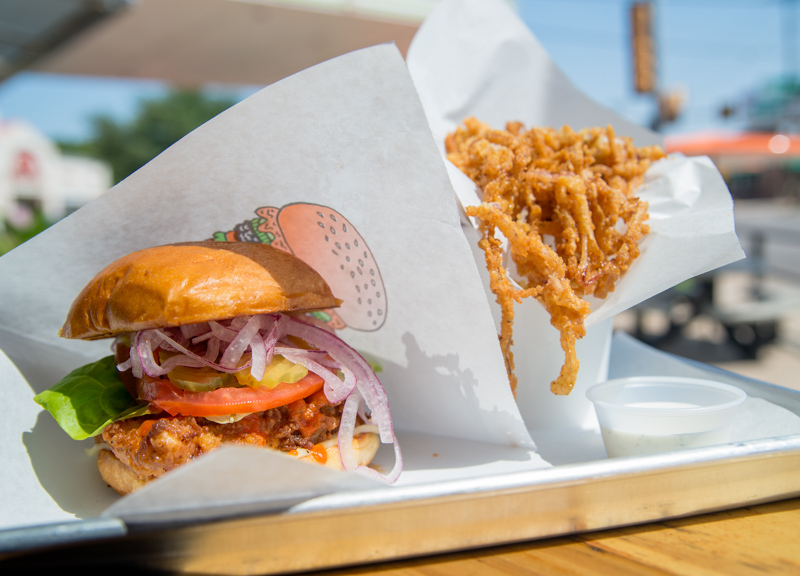 The Magic Man chicken sandwich, with it’s made-from-scratch buffalo sauce, makes for a satisfying eat. 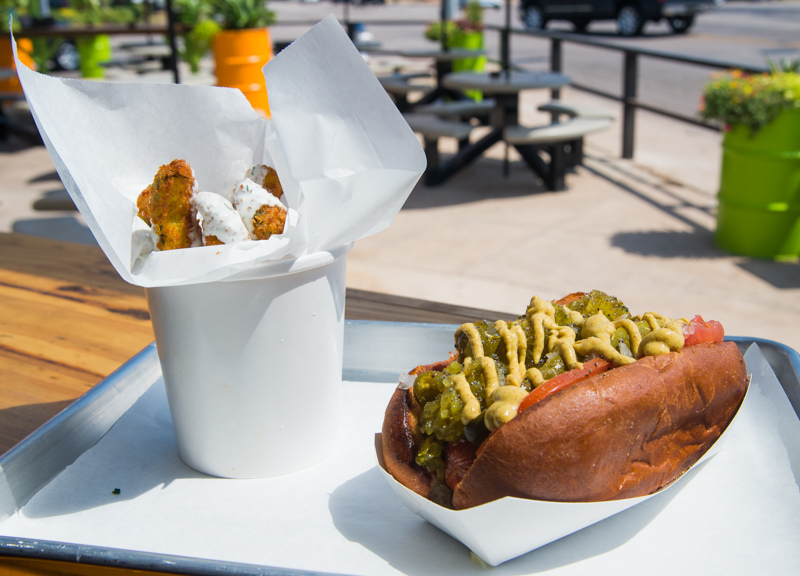 The enormous Chi-Town hot dog, served in a custom-baked potato bun, is bursting with flavor. The fries are an excellent combination of crispy and soft. The onion rings are also delicious, if so thin that they actually a bit of a challenging to grab and dip. Better still, you can score a sandwich, a side and a soda for the very amenable price of $10 or just thereabouts. 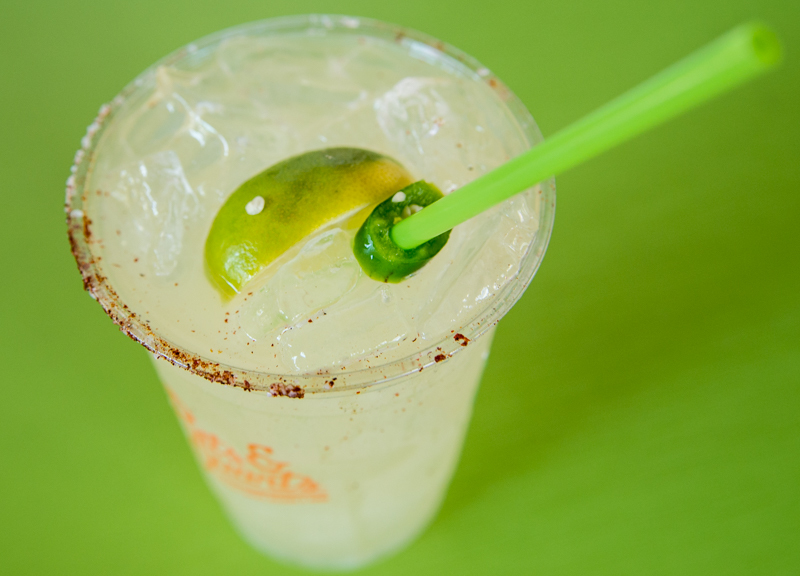 For a bit more, you can also indulge in the restaurant’s craft beer and custom-designed cocktail menus, the highlights of which include the Rocket Fuel (fresh ginger, habanero-infused Milagro Silver tequila, agave nectar, pineapple nectar, ginger beer) and the Thyme-ing Belt (Tito’s vodka, strawberry nectar, lemon juice, thyme, simple syrup, soda). No, Humphries has never been one to get scared by a little competition. 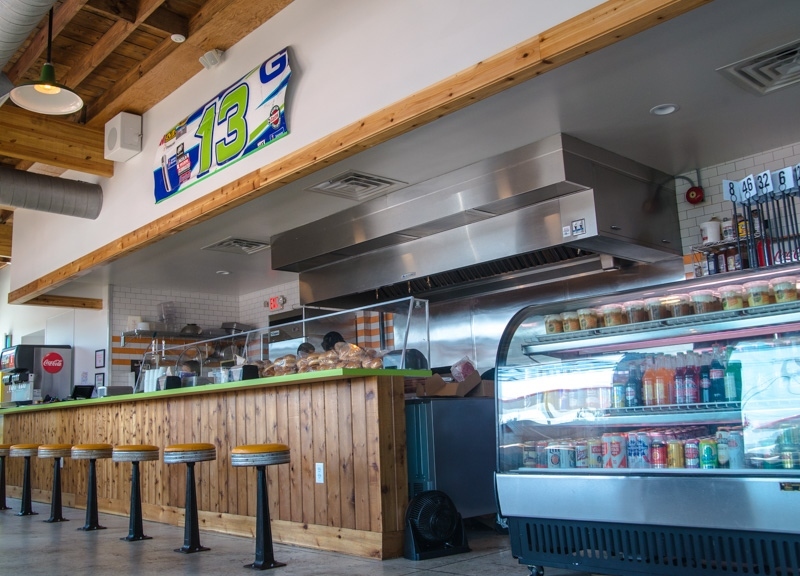 Actually, with Ps & Qs now in the fold, it’s everyone else in the Dallas burger game that should maybe be a little frightened.